Eye by exhaustion is a term coined by Tamsin that describes an eye-making technique. Here, an eye is formed because the required throw-in move required to falsify this eye turned out to be a suicide move. This example is a sample problem from the Korean Problem Academy (on Gobase). Black to live. After and , Black makes two eyes and lives because the existence of the stones make both a and b suicide moves, which is illegal in some rulesets. In Tamsin's terms, the White stones are too "exhausted" to go one step further. Even if self-capture is legal, such as when using Ing's rules, Black still lives. Because when makes a self-capture, it is Black's turn and Black can now play at . Similarly, is answered at . is a mistake. After , the chain containing has two liberties, and the atari at a and b are miai. Black is dead. Although there is no difference in the status of the groups with "eyes by exhaustion" when different rulesets are applied, there is a difference where ko-threats are concerned. 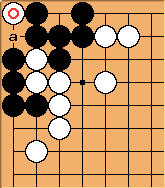 Here, White has a (loss-making) ko-threat at a if self-capture is allowed, but White has none otherwise.